FCC’s 5 GHz spectrum initiative could mean more and wider channels for IEEE 802.11ac « Steven J. Crowley, P.E. FCC Chairman Julius Genachowski yesterday announced an initiative to make 195 MHz of more spectrum available for Wi-Fi in the 5 GHz band. The last time more spectrum for Wi-Fi was made available in this range was in 2003, when an FCC increased the then 300 MHz bandwidth to 555 MHz. As the document in that last link shows, the 5 GHz band is not as neat as the 2.4 GHz band, with other services, such as radar, requiring protection. These coexistence issues will have to be looked at again. 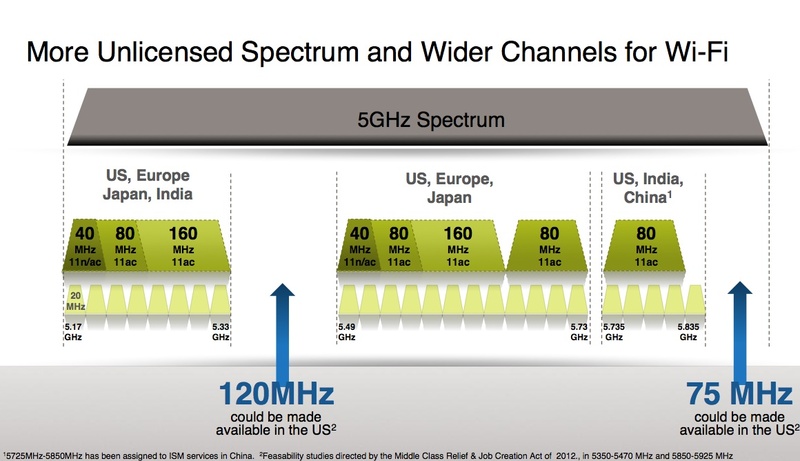 Though Genachowski’s emphasis is on Wi-Fi, this new spectrum might also become available to other devices that operate on unlicensed frequencies, such as the IEEE 802.15 family of technologies (Bluetooth, ZigBee, smart meters, etc.). Any coexistence issues with Wi-Fi would be dealt with within IEEE 802. This entry was posted on Thursday, January 10th, 2013 at 8:18 am and is filed under 5 GHz, Qualcomm, Spectrum, Uncategorized, Unlicensed, Wi-Fi. You can follow any responses to this entry through the RSS 2.0 feed. You can leave a response, or trackback from your own site.